25 pre-cut tape strips. Adhesive at each end of strip bonds securely to sides of a package, creating adhesive-free loop for carrying up to 15 pounds. Handle is custom printed with brand and product information including UPC bar code and logo. 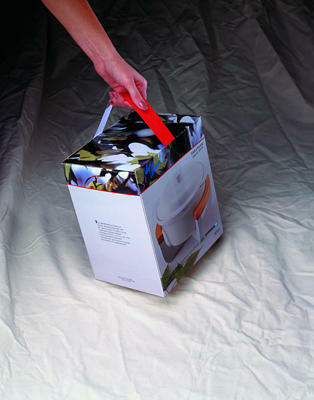 Adhesive at each end of plastic film tape bonds securely to the sides of a package or product, creating an adhesive-free loop between for carrying. Loop can be custom printed with brand, product, and store information.